A review of Underwritten States: Marine Insurance and the Making of Bodies Politic in America, 1622-1815, by Hannah Atlee Farber. Marine insurance companies played a critical role in the economic and cultural life of the early United States, not only as engines of highly successful commercial and financial development, but as republican polities actively engaged in shaping the emergence of a fundamentally “new political economy” (p. 1). This is the central thesis of Farber’s dissertation project. While this work raises many interesting and important questions on the relationship between the post-constitutional order and the emerging economy of the early Republic, its central problematic addresses the proliferation of corporations engaged in the pursuit of profit and the accumulation of capital within an emerging federal republic whose moral and constitutional principles exhibited profound discomfort with the political influence and authority such wealth afforded. Refiguring the history of the marine insurance company as a corpus, both economic and political, the project is primarily an institutional history in which the historical and sociological implications of the interactions of capital and the state are traced over three centuries. From the early modern period, under the aegis of the English and later British imperial state and culminating in their transformation following the American Revolution, down to the period of maritime turbulence during the Napoleonic wars, mercantile insurance companies Farber argues, acted as “profoundly important political institutions” (p. 9). American merchants looked to marine insurance as a set of customs, laws, and practices, which conferred a shared sense of identity, amounting to a form of governance ultimately constituting a body politic. Farber’s central insight is to argue against the rise of American corporations as a vehicle by which mercantile elites channeled their wealth and influence simply and straightforwardly into domestic political power. Instead, the project charts the ways in which the marine insurance companies established in America’s port cities and after the Revolution, incorporated themselves as “minor republics” (p. 62). They performed vital functions as wealthy institutions in the new financial architecture of an emerging nation, forming relationships and channeling aggregated capital to other American body politics (including banks and the federal government itself) for the purposes of internal improvement and speculation. In doing so marine insurance companies inhabited two polities simultaneously; the polity of merchants and that of the new United States. These companies could interact with the state in mutually reinforcing ways, through the channeling of information or capital to the American federal government, or alternatively, threaten to undermine America’s still tenuous national independence, reaping “huge profits” (p. 3) by underwriting the nation’s antagonists against the losses of war. Farber see the consequence of this uneasy cohabitation as a “continuation of the American Constitutional process, a less-discussed later stage in the negotiation of the place of mercantile wealth in the republic” (p. 5). Ultimately marine insurance companies remained curiously positioned, both within and outside of the larger American republic, and highly attentive to the threat of assimilation by the state. Chapter one of Farber’s dissertation contextualizes the claim that a polity of merchants arose under the influence of lex mercatoria in the early modern period. As a body of law outside of the civil law of territorial states, the law merchant place considerable importance on the proper practices of marine insurance as a set of rules for the fulfillment of contracts and the settlements of disputes. Farber charts the way in which the influence of the law merchant began to gain greater significance and relevance in maritime affairs, during the seventeenth century, just as the English state began to substantiate its institutional power and reach. As the business of marine insurance increased exponentially with the rise of colonial trade after 1600 and the expansion of imperial warfare in the eighteenth century, British and European states sought to gain some control over these streams of profit by offering companies formal charters of incorporation. In the context of the late seventeenth and early eighteenth-century English financial revolution Farber discusses how marine insurance companies constituted themselves as body politics; “they pooled a great deal of capital and acquired a new kind of political power.” By lending money to the British state they were afforded legal privileges but were also subjected to “new kinds of rules and concerns” (p. 51). Chapters two and three move the project’s narrative forward from the early eighteenth century to the Age of Revolutions. America’s break with the British Empire and the ratification of a federal republican constitution ushered in a wave of financial enthusiasm. Farber uses the chartering of the Insurance Company of North America as a case study, examining the process by which its founders applied for a formal charter from the Pennsylvania legislature. Rather than seeing the political controversy which ensued as emblematic of the corruption of a largely agrarian republic, Farber sees debates over incorporation as a continuation of the formation of the constitution of the federal republic. A polity of American merchants had existed before the Revolution and the political events of the 1770s and 1780s forced a re-integration of that mercantile wealth into a newly established polity. In broader terms the political economy of the “post-Constitutional United States” (p.6) was constructed through the relationships insurance companies forged with other body politics, including banks and state governments, as well as the federal government itself, purchasing large quantities of government securities, and using the interest and returns to fund the growth of their operations. In forming links with diverse financial bodies insurance companies blurred the lines between formal and informal lending, borrowing and issuing credit in a highly leveraged economy. Chapter four considers the manner in which insurance companies established themselves as patriotic and improving institutions, bent on a polite and civilized form of commerce, loyal to republican principles and the American nation. Amid skepticism from political elites and the general public on the loyalty of merchants as citizens, wealthy and successful insurers used a variety of cultural methods, from the arts and letters, to their engagement with civic affairs and improvement projects, to establish public faith in their prudence, the reality of their otherwise highly speculative wealth, and above all their loyalty to the nation. Farber’s final chapter is less domestic in its focus and centers on the relations of American insurance companies with the federal government during the French Revolutionary and Napoleonic Wars. This period of “near-constant warfare and political unrest” (p. 171) saw insurance companies reach new levels of influence in the foreign policy decisions and international relations of the American nation-state engaged with its largely European rivals in commerce and politics. By setting insurance rates and mapping the boundaries of American commercial property, insurance companies codified the commercial prospects and standing of the new nation and helped define its jurisdictional and territorial claims to commercial sovereignty as a nation. Lastly and probably most palpably, marine insurance companies provided sources of much-needed capital to a fragile government faced with the military might of Britain and France. In establishing this point Farber alludes to her larger argument; that companies would only lend to the government on their own terms, to protect their independence from the dictates and control of the state. Farber establishes a firm foundation for the argument that historians have tended to focus too heavily on the nation-state as principal actors in global affairs. Instead, we should consider “other types of institutions that lived within and alongside these states, dependent on them and yet persistently distinct from them” (p. 173). Integrating previously distinct fields of scholarship on the history of finance, corporations, and post-constitutional politics, Farber demonstrates clear and compelling interconnections. Borrowing conceptually from Pauline Maier’s “vision of the early American republic as a … concatenation of various corporations, political, civil, religious (sic) and economical” so that the American nation state was a “great corporation, comprehending all others” (p.7) Farber pushes this paradigm to its limit, interrogating the construction of the nation-state as a singular, territorial entity of sovereign authority, and questioning its capacity to hold together and assimilate diverse forms of association and inequalities of power. The project draws on the advances in understanding of the international significance of the American Revolution for debates about the nature of sovereignty and the law of nations. Farber’s point is to elucidate the centrality of the merchant polity within the confusing and overlapping array of claims to sovereignty and legal authority in the early modern Atlantic. A central influence on the dissertation’s argument and approach is Philip Stern’s The Company-State: Corporate Sovereignty and the Early Modern Foundations of the British Empire in India (Oxford University Press, 2011) which examined the formation of the East India Company as a corpus politicum. Not limiting her historiographical references to commercial corporations or to polities as states or conventional political communities, Farber also cites Mark Peterson’s forthcoming study of Boston as a city-state and Owen Stanwood’s “conception of a transnational Huguenot polity” (p. 10). Farber also acknowledges the influence of scholarship on the history of merchant life in the early modern British and North American Atlantic, particularly the response of members of the merchant class to warring empires, their strategies of success, survival, and organization. Writing on the history of “marine insurance as a merchant institution” (p. 11), Farber seeks to contribute to this historiographical field by adding to our understanding of the nature of “mercantile ideology and political organization” (p.11). Her ultimate verdict is that merchant’s ideas and associations penetrated deeply into the political and social fabric of early America in ways which point toward unseen connections and relationships between government and merchant capital. Farber’s ambition is to elucidate the ways in which the writing of the history of marine insurance can provide an alternative framework from which to understand key events such as the War of 1812 as episodes of commercial “growth in the midst of maritime turmoil” (p. 9). The project’s most direct intervention is in the historiography of insurance, a broad and geographically segregated field of research covering European and American corporate history. Drawing most palpably on studies of eighteenth-century British marine insurance, this dissertation highlights the ways in which the American state, like the British, made accommodations and concessions to insurance companies, which proved mutually beneficial in times of war. Rather than engage with the question of insurance companies relationship to the emergence of capitalism, an issue Farber associates with continuing nineteenth-century controversies over the timing of transitions to market revolutions, and the history of liberalism, the project clearly seeks to recast the debate about the rise of American nationalism, exploring the connection between republicanism, maritime commerce, and claims to sovereignty and self-government. This dissertation will contribute to and inform a variety of research agendas within American history. Its major contribution will lie in the economic history of Revolutionary America and the early United States. Farber’s work illustrates the growing diversity of economic history as a field characterized by an array of methodological, temporal, and geographical approaches. Equally this work will provide an important addition to the history of banking and the new financial history (particularly the latter’s focus on the American state) both fields whose importance has become vital to our understanding of the role of finance in establishing American independence and commercial expansion. Equally Farber’s dissertation will interest those scholars engaged in a growing debate about the nature of the American state, its controversial and contested origins, both institutionally and ideologically. Finally, Farber’s research can be understood as a timely intervention in debates about the nature of republican ideology and practice within American political economy. The history of republicanism, a moribund field until recently, one again shows signs of yielding real insight into the origins of the economic and political power of the United States. “The Constitution of the Boston Tontine Association.” Boston: s. n., 1791. University of California, Berkeley. 2014. 271pp. Primary Advisor: Mark Peterson. 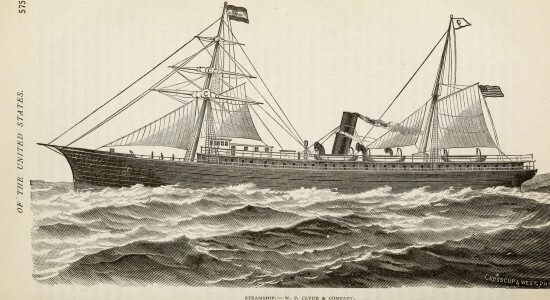 Image from Industrial History of the United States (1878). Wikimedia Commons.